Central to the ethos of the Reserve, is the aim of achieving sustainability through on-going research and continual monitoring of a balanced ecosystem, in a belief that it makes better environmental as well as financial sense, to maintain a natural environment than it does to attempt to repair one. A natural seed bank project was initiated with the planting of 6,000 indigenous trees and shrubs, which has started to pay dividends with the recruitment of Acacia trees and Calligonum shrubs. The 70 endangered Arabian oryx which were re-introduced into the protected area now form the basis of today’s herd of over 400 Oryx, the largest, free roaming herd of its kind in the UAE. 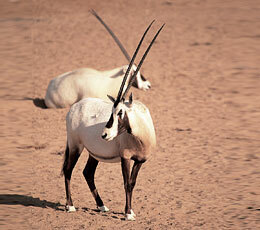 In addition there are approximately 300 Arabian Gazelles and 100 Sand Gazelles. In 2003, the list of birds in the DDCR consisted of 60 species. The improvement of the environment through protected area management has resulted in the recording of 126 species. Other species that occur naturally include the Gordon’s Wildcat, Arabian Hare, Ethiopian Hedgehog and the Arabian Red Fox. There are also a number of reptiles as well as both residential and migrating bird species. Through baseline surveys, research and other observations 74 plant, 18 mammals, 26 reptile, 140 bird species and 300 arthropods have been identified. Using solar power to pump water from water holes for self sufficiency. Conducting waste re-cycling at all the operator camps. Providing limited access to designated areas of the Reserve has been given to five Dubai based tour operators for minimal impact, with specific routes and activities and limits on daily visitor numbers and vehicles entering the Reserve at any time. Training safari guides in best practice methods for conducting desert excursions and increasing knowledge of wildlife and conservation practices. Placing strict limits on all activities which place pressure on the habitat. Careful zoning within the Reserve to ensure the more vulnerable habitats and particularly sensitive locations are spared heavy visitor traffic and unnecessary interference.